» Forum » All Pinball » All modding! » Bally "Star Trek" Backglass Mod! 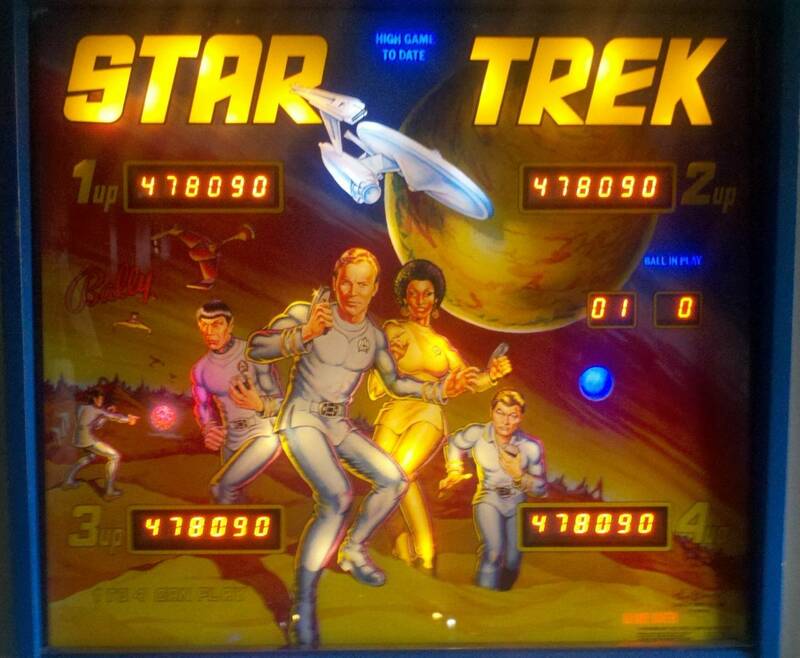 » Bally "Star Trek" Backglass Mod! Bally "Star Trek" Backglass Mod! 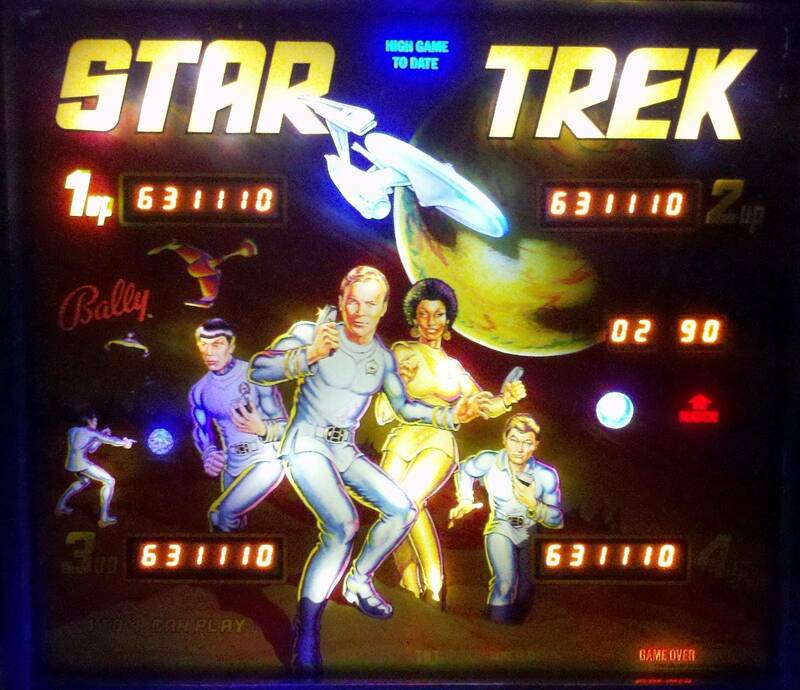 For all of you that own a Bally Star Trek here is a great and simple mod that makes a big difference to the backglass artwork. Have you noticed that the blue planet on the right side of the backglass is not illuminated? It is a very predominant artwork feature that simply gets lost. I always wondered why there wasn't a bulb put in that location but when I saw the original backglass artwork there was no planet there. Guess when they changed to the movie version backglass with the extra planet and Klingon cruisers they never changed the position of the illumination bulbs to highlight the new added graphic features. I figured that a blue bulb in there would really make that planet pop! So for this easy mod I measured the location and simply drilled a 1/2 inch hole through the plywood panel that holds the bulbs. I then added another socket and installed a Cointaker blue 170 LED. Now that wonderful planet really pops out!! For the rest of the backglass I have Cointaker 170 warm whites in all of the sockets except for 3 cool whites behind the Enterprise and 10 warm white frosted from pinballbulbs.com behind the "Star Trek" up on top. The Cointakers where not bright enough to make "Star Trek" stand out. Also blue 170's in hi score and ball in play, reds in tilt and match, oranges in game over, and a slow color changer behind the "energy ball". Below are before and after pics in darkness and then in daylight room lighting. Hope you all like it! Thanks! I know you said it... but pics or it didn't happen. OK, OK. I added some daylight pics. The night ones will be better though! Just added the night time pics to the original post above. The "flare" is from the camera and not visible to the eye. It's a minor improvement but with the backglass retrofitted with LED's it sure makes it look a lot more clear and defined and most definitely brings out the colors a lot better. Below is a pic with standard 47 bulbs so you can compare the difference with or without LED's. Never noticed that Bones had been working out for that. He looks like the Hulk. Nice upgrade to the game! I applaud your initiative but I'm not sure that little moon really needs its own bulb. Is the little moon really that interesting or such an important part of the backglass to merit making it "pop", drawing the eye away from the crew? I don't think it deserves to be highlighted. However, the color-changing LED for the 'energy ball' is really neat. But that's about all I would have changed aside from swapping in 47's. I went with the Cointaker 170 warm whites behind the crew as most of the hues are in the orange and yellow in that area and also the skin tones are in the warm zone. Regular 47's just seemed to wash the colors out more while the LEDs highlighted them instead. Tried the cool whites there but it just didn't work especially with the skin tones. Also tried the Pinballbulbs.com frosted bulbs there but they were too bright and caused to many "hotspots". The Cointaker 170 warm whites just looked the best filling out the hues just right. Now behind the enterprise the cool whites where the obvious choice and helps make it stand out against the warm whites. Well I really like that planetoid feature being highlighted. Also the backglass is opaque at that spot so it was intended for some light to come through to highlight that feature. Problem was there was no lamp close by. The blue may be a bit intense and a cool white may work better. I will experiment a bit more when my next order of LED's get here next week. You need to remember that the photo isn't quite the same as what you see with your own eyes especially being that I'm just using my cell phone camera. Blues really seem to "glare" a lot more in a photo. In real life it looks pretty sweet! I do thank everyone for all the great feedback! OK, I just received a new shipment of LEDs and I went ahead and changed the planetoid from blue to cool white. I think I like it better as it shows off the actual colors of the artwork a lot better. It doesn't get buried in just blue! Here is a pic but it really doesn't show the detail like you can see it in real life. can you take a photo with more external lighting on the backglass, or adjust your camera to make it darken the photo instead of compensating to make it so bright. I've been playing with lights behind my Skateball glass and know what you mean about photos being hard to take to show it the way your eye sees it. I have been trying to do that. Problem is that this is my cell phone camera and it doesn't have much adjustability. I will try again in the morning to see if I can get a better pic with some daylight. Thanks! 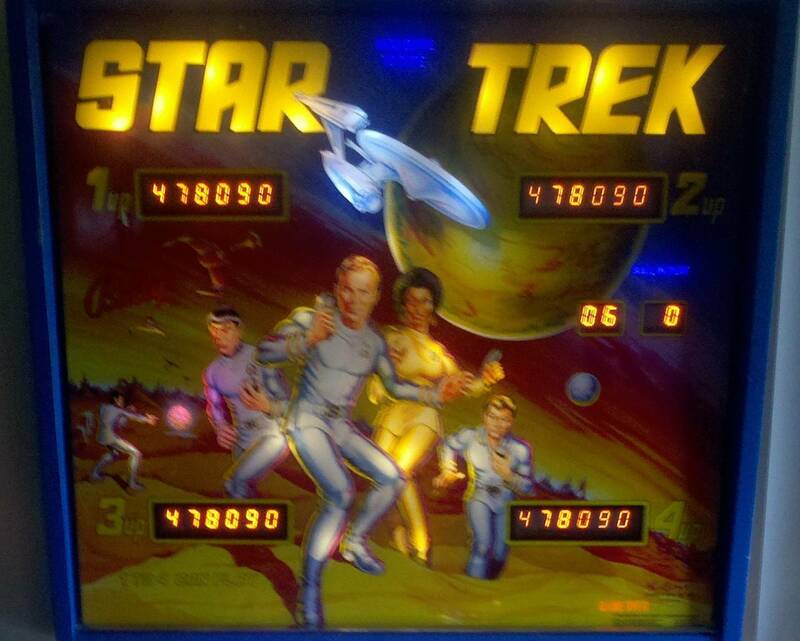 Here is my Bally Star Trek YouTube I just put together. It shows what it looks like with a full LED conversion. Enjoy!